Keeping up with class notes can literally get a little messy sometimes. 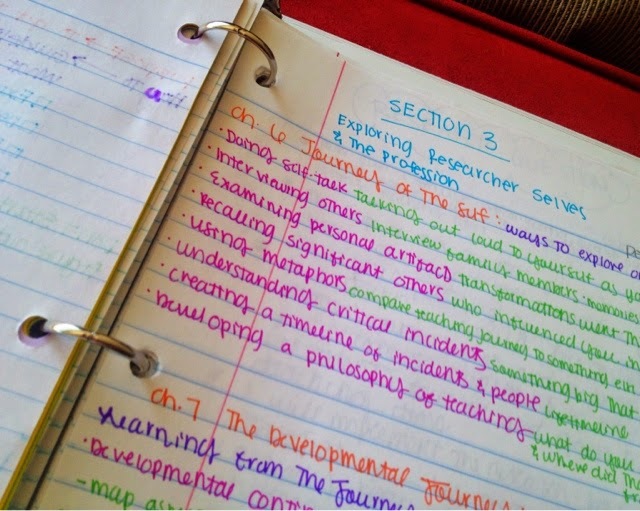 I didn't start rewriting mine until my junior year of college when my Landforms professor mentioned it... but ever since then, my newly-rewritten, color-coded notes have acted as study guides for upcoming quizzes, tests, and exams! So, knowing exactly where to find what information is super important! And obviously, it required a system! The way it looks has transformed over the years, but the main idea stays the same! Every semester, there are a certain number of quizzes and exams. They are almost always on the syllabus (I don't think I've ever had a college professor give a "pop quiz")... so there is pretty much NO reason not to be prepared for them! When I rewrite my notes, I try to make them look like a study guide... or an infograph... or something else remotely interesting to look at! Hence, all the different colors, silly doodles, and bullet points! Try to fit as much important info as you can onto one page! Then keep all of the notes from every class together and in chronological order! Last year, I tried out a filing system. This year, I'm using a binder. Some years, I just put them in a designated side of my class folder. Different things will work for different people (and different professors' teaching styles), so don't be afraid to change it up! Just be sure to be consistent with whatever system you choose to use! 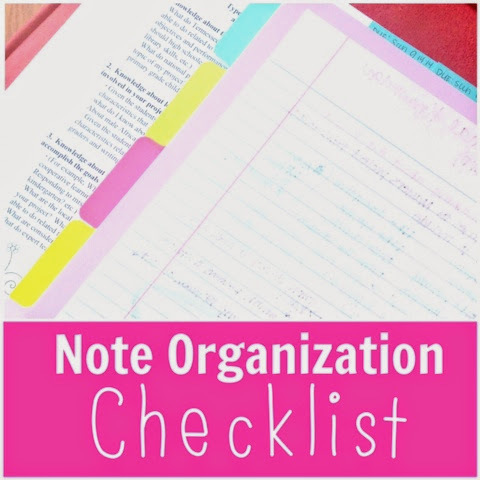 Keeping all the notes together is the most imperative part of keeping them organized! Be sure that each page of notes is labeled with a date and topic header. This will help you quickly flip through the top of your papers as you look for particular chapter notes or notes from a specific time frame! Since tests are usually organized by a few chapters at a time (Chapters 1-4, or 5-8), it's helpful that these notes are all back-to-back wherever you choose to keep them. If you've been writing page numbers in your notes, you probably know exactly which pages the questions will come from, too! 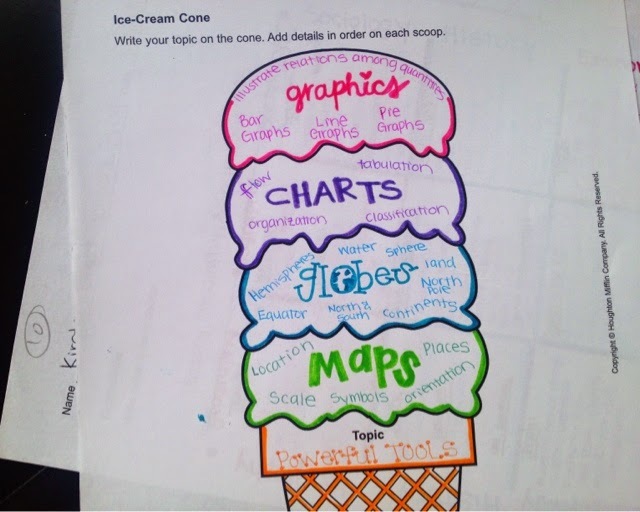 And if you used a graphic organizer to help you rewrite your notes, definitely don't leave that out! 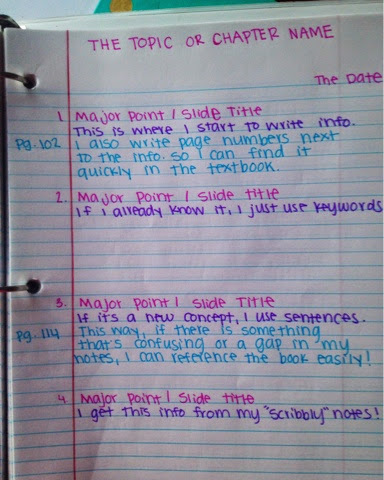 Date and label them just like you would any other page of notes! In my opinion, these are some of the most helpful "study guides" because they are just very visually-easy to read. 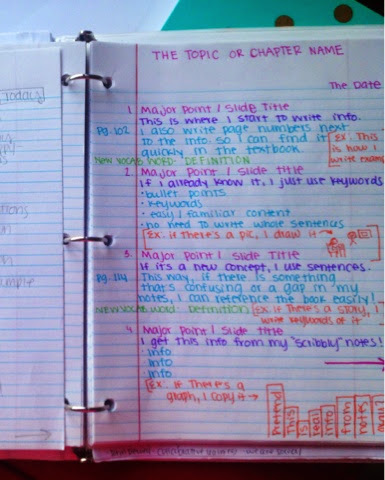 A good combination is to outline the actual textbook chapter and rewrite your class notes using a system that works for you! Between those two documents, you should have all info you need for the exam! Once I finish with a particular section of notes, I either put them in the back of the "notes" section or I paperclip them together to let me know that I'm finished with that information. Don't throw them away! It's always nice to keep them around just in case you need to revisit something in the future... or if you have a (*DUN DUN DUN*) comprehensive exam at the end of the semester! (aka: how you know your professor really hates his/her life and wants you to be miserable, too). If that's the case, better start those flashcards now! 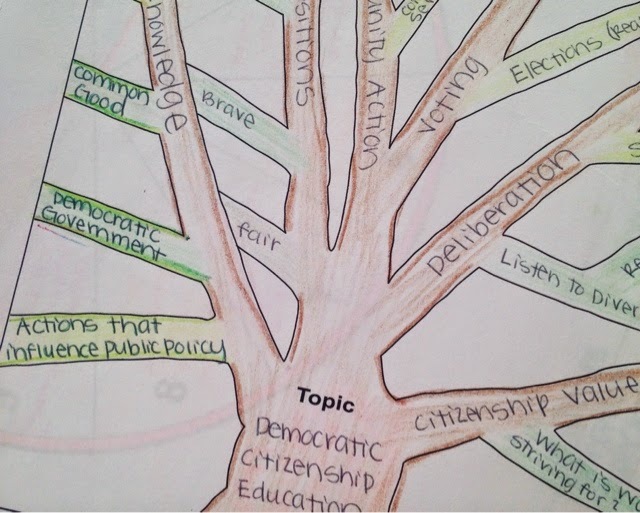 Finally, don't be afraid to use some "mixed media" to help you quickly identify useful information in your notes! Post-It's, Sharpies, Washi tape are all awesome ways to draw attention to information that you'll need to find quickly again (...and again... and again) throughout the semester! 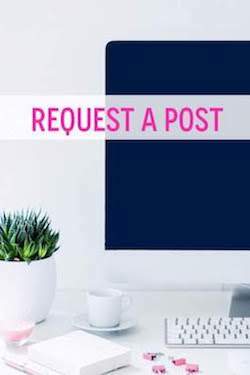 At the end of the day, "organization" is a pretty subjective word, so you need to find out what it means to you and implement the best practices for yourself to keep up with the information in your notes! And even though I joke about comprehensive exams, don't let them stress you out either! Because so much information is covered on them, nothing really gets too in-depth so I actually think they're easier than exams that cover more narrow scopes of information. MAKE YOUR NOTES EASY TO READ & KEEP THEM TOGETHER! 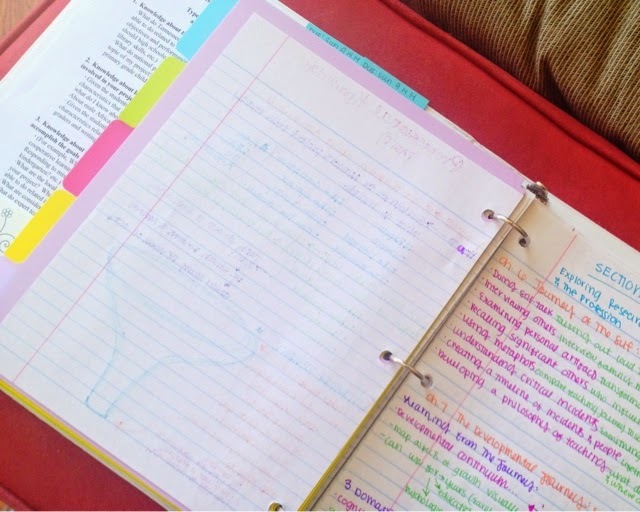 How do you keep your notes organized throughout the semester! Do you tear them out of your notebook or just flag the pages? 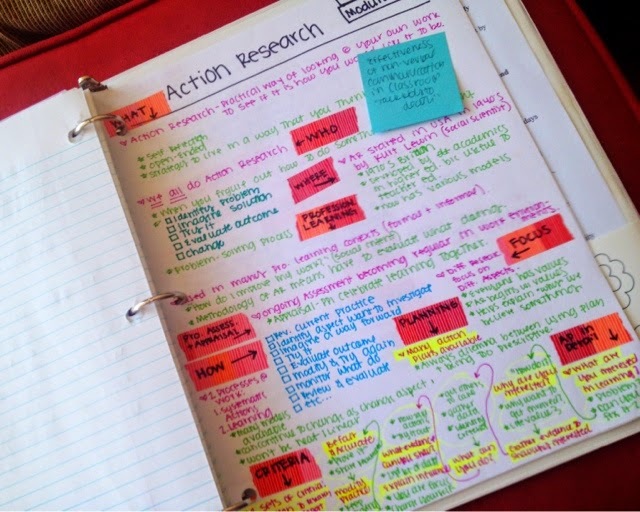 Or if you keep notes on your computer/iPad, how do you save/study them? !